Update: Acting AG Whitaker's exchanges with Rep. Sheila Jackson Lee (D-TX) were just as testy. He poked fun at her line of questioning, and she lost her temper with the witness. “Mr Attorney General, we’re not joking here and your humor is not acceptable,” she told him. Rep. Jerrold Nadler (D-NY) began Friday's hearing with Acting Attorney General Matthew Whitaker by sighing over how uncooperative he has been with the House Judiciary Committee. The panel had given Whitaker plenty of opportunities to prepare for the questioning, Nadler argued, but it was "clear" he hadn't. When Nadler got his five minutes to ask questions, they were all about Robert Mueller's special counsel investigation into Russian collusion. The Democratic chairman asked Whitaker repeatedly how often he'd been briefed on the Russia probe, and whether he had relayed any of that information to the president. Whitaker said he can't talk about ongoing investigations, but that yes, he has been briefed on them. He is the person "ultimately in charge of the investigation," yet insisted he has not interfered in any way with it. When Nadler kept pressing him on the same matter, that's when things got entertaining and when Whitaker started snapping back with some fresh quips. "I know you’re very interested in the special counsel investigation," Whitaker noted sarcastically. He added that no matter how many times he's asked, he's already said "all I plan on saying" about the number of times he was briefed on the investigation. But that didn't stop Nadler from trying one more time. As Nadler started to ask again about his relationship to the Russia probe, Whitaker uttered perhaps the most savage response ever from a witness on Capitol Hill. "Mr. Chairman, I see that your five minutes is up." When it was Republican Rep. Doug Collins's (R-GA) turn to speak, he excoriated Democrats for waging nothing more than a "character assassination" against Whitaker with the goal of embarrassing President Trump. 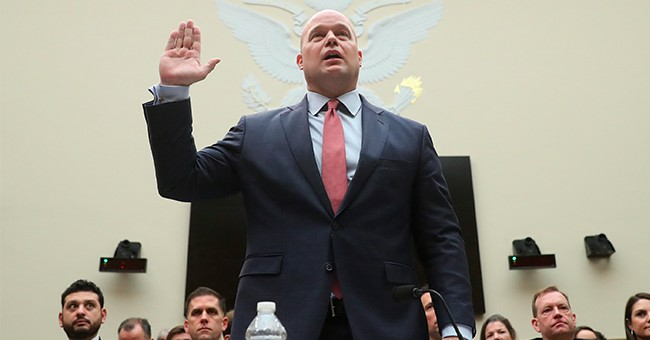 The contentious setting for today's hearing had already been set a day earlier, when Whitaker informed Democrats on the House Judiciary that he would not show up unless they drop their threat of a subpoena.